Maharashtrian food covers a wide range of dishes that vary according to different regions of the state. All the cuisines are mouth-watering, and they have variety of preparations from the mild to some very spicy ones. Now, there is an opportunity to explore different varieties of these delicacies by being a part of Maharashtrian Food Festival that would be held from 20th April to 2nd May at Hotel United-21 of Thane. This event would also celebrate Maharashtra Day which falls on the 1st of May. It would be held in Blue Flame, where buffet dinners can be enjoyed along with a Global BBQ facility. This hotel is the region's only 4-star hotel which offers world-class facilities and services for its guests. Business travellers and leisure tourists can have a comfortable stay in its spacious and comfortable rooms or suites that are well-equipped with all the modern amenities. But, residents of Thane find its Lifestyle Family Club very interesting, as it hosts different types of events on a regular basis. Usually, these events are held on special occasions and offer great opportunities for participants to walk away with special prizes. Other amenities in this hotel include Steam & Sauna rooms, Spa, Salon and a Meditation Room. 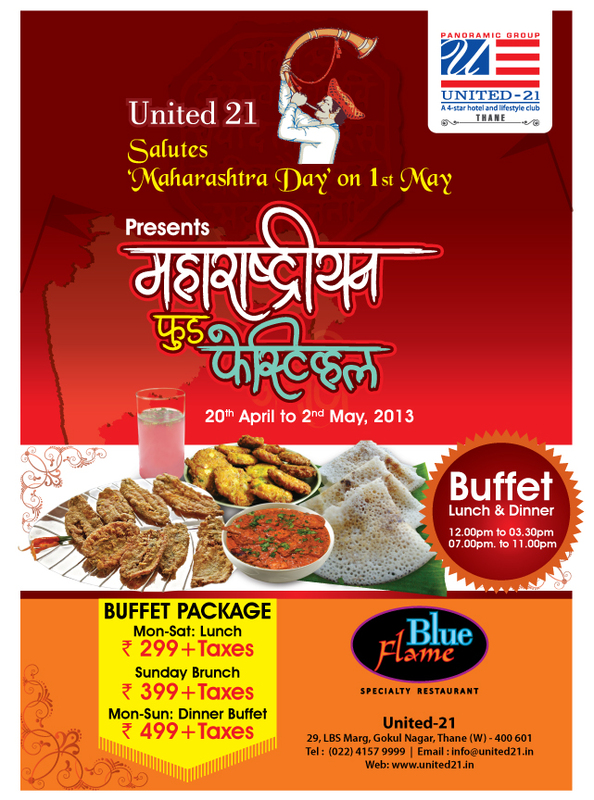 People who wish to savour different varieties of Maharashtrian cuisines can be a part of this wonderful event. This Maharashtrian food fest would also be a great opportunity to get introduced to different types of dishes that are prepared in various regions of the state. The buffet lunch and dinner at Blue Flame includes all these delicacies and have been offered for guests at reasonable prices. The management has done this to ensure that every individual who wants to be a part of this event gets a chance to experience the exotic flavours without worrying too much about the costs.